In summer of 2015 I spent a week at a gathering on Cortes Island, in an archipelago known as the Discovery Islands off the British Columbia coast. You drive three hours up the east side of Vancouver Island (after first getting yourself to Victoria), then take an hour-long water taxi, weaving through channels and straits before landing on Cortes and being driven to Hollyhock, a collection of cabins and meeting halls nestled in tall evergreen forests on the island’s east side. There were about a hundred people at the gathering, engaged in exchanging a multitude of ideas that were all aimed, from different perspectives, at bringing humans into greater harmony with each other and with the planet. Each morning there was a plenary gathering in the main hall, but the afternoons were given over to free-form breakout gatherings organized by anyone who had an idea or program they wanted to present. There were at least six different venues and two sessions after lunch, so as many as twelve different topics to choose from. One of the reasons I had come was to talk about PROSOCIAL, so I scheduled a breakout session for the last day of the gathering. A month earlier I’d begun working as PROSOCIAL project coordinator. We’d been developing the website, but it wasn’t quite yet ready for release. The session was held in a circular timber-framed meeting hall nestled in the woods. It wasn’t a giant crowd, about six or seven people. One, however, captured my attention early on, when she asked if PROSOCIAL could serve as a system of governance for a group. I said it could, and furthermore, that was an aspect of PROSOCIAL that I was particularly interested in myself. 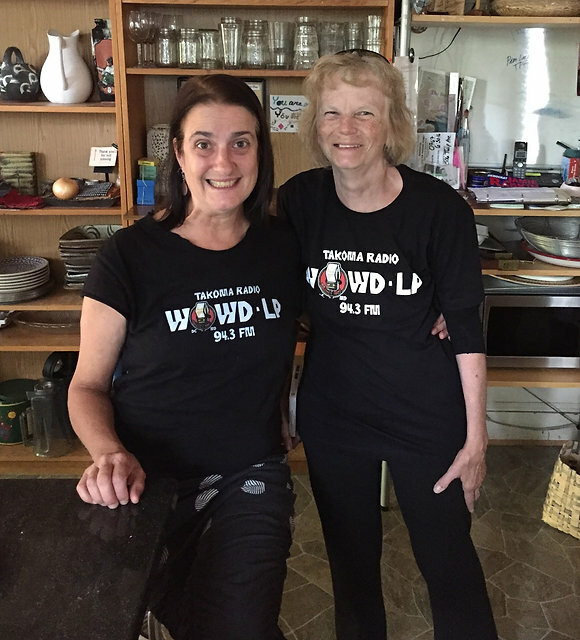 Her name was Marika Partridge, and she explained how her group was launching a community radio station in Takoma Park, Maryland. They were looking for an appropriate and effective method to govern their new organization, and keep their mission on track. Marika had begun her career in community radio in southeast Alaska, where she’d grown up. She later moved to Washington D.C. and became a producer and director at National Public Radio. She founded Takoma Radio WOWD in 2011. By summer of 2015 they were finally about to get their license from the FCC. They hoped to begin broadcasting by the middle of 2016. When we left Hollyhock to return home, Marika and I made arrangements to talk in a couple of months, to figure out the best way for Takoma Radio to try out PROSOCIAL. It was November before we got started with the course. The arrangements we made were that I would lead the sessions via Skype from my office on the west coast, while the four of them sat in Marika’s living room in Maryland. I listened and spoke through a laptop on the coffee table. Diana Kohn, a longtime resident of Takoma Park and a community activist. She is also president of Historic Takoma, the parent organization of Takoma Radio. Tatyana Safronova, Station Manager. She’s previously worked as a teacher, journalist and community organizer. Currently she also teaches audio production at the DC Public Library. Désirée Bayonet, who has been facilitating audio storytelling workshops for Takoma Radio since 2013. She became involved in community radio as a Peace Corps volunteer in Senegal, West Africa. She believes that sound and music can bring people together and build community. As a group, they made my job as a facilitator easy. 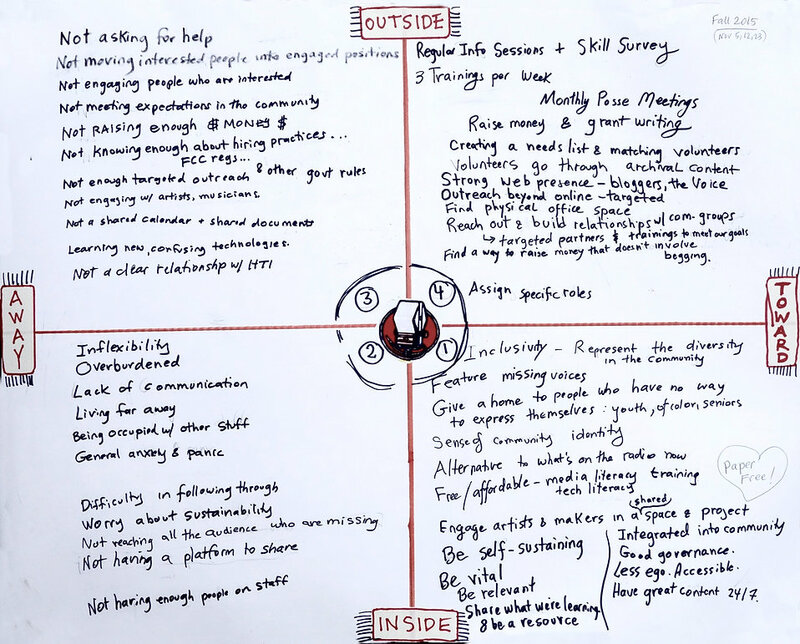 Most importantly, they already had a well-developed sense of identity and purpose, so when we started to go around the matrix in the lower right quadrant, it required very little prompting to get them to flesh out the elements of their valued goals. They gave permission to reproduce the matrix they created that day. They added some touches later, like their microphone logo, a symbolic conduit to their community, at the center of the four quadrants – the location of psychological flexibility. The group matrix is at the heart of the PROSOCIAL process; it represents a merger of contextual behavioral and evolutionary science, blending the methods of ACT with the insights ofmultilevel selection theory. In my very limited experience, the manner in which the members go around the matrix together is a good indicator of their ability to function as a cohesive and coordinated group. The women of Takoma Radio began with an effective focus on their goals and values in the lower right. However, as the discussion moved over to the away side, the process became more free-form. While I found myself at first trying to keep them focused on an orderly clockwise progression and a reasonably strict division between “in the head” and “in the world”, I soon came to see that the process would sort itself out. When someone made a suggestion for a quality to include on the chart, the group could discuss which quadrant it belonged in, which provided an additional opportunity to contemplate the differences between them. This process seemed as important as the quadrants that they finally decided upon. We met again about a week later, after they’d gone through the design principles online, and I’d generated their summary report. As I’ve found with other groups that were relatively new, or just being created, the design principles can be a more difficult exercise, and at first perhaps less rewarding than the matrix. The members may not yet have worked together long enough to accurately assess how effectively the principles are functioning within their group. Moving toward the values and goals on the right side of the matrix is the more aspirational aspect of PROSOCIAL. The design principles are the more practical framework on which to express those aspirations over time, giving them a solid foundation. That’s what makes them useful as guidelines for long-term governance of a group. After Takoma Radio finished the course by setting their short-term goals, we made vague plans to talk again in the future, to see how well PROSOCIAL was working out. So I got back in touch with Marika in March of 2016, to see how they were doing with their immediate goal, of beginning to broadcast in June. She said they were, and it was exciting. Without too much prompting on my part, she attributed some measure of their success to PROSOCIAL. She explained that they kept their mounted matrix around as a visual touchstone, and it did indeed help to keep them on track. That was heartening. So we scheduled another group Skype in April. During that conversation, Diana, Tatyana and Désirée reinforced how effective PROSOCIAL had been, and particularly in this early stage, the matrix. It put them on the same page, quite literally, since it was all there to see. They said that while they already knew much of the information they put up in the four quadrants, the process of doing it graphically served to integrate the information effectively in their consciousness as a group. They thought that the process of writing things down in this structured format brought issues to light that might have remained hidden, and it provided the opportunity to air anxieties that they might not have otherwise expressed. I asked them about the design principles next. Had the principles become more relevant to their efforts over the last several months, since they’d really gotten down to work? We went over the principles to see what sort of progress they’d made. 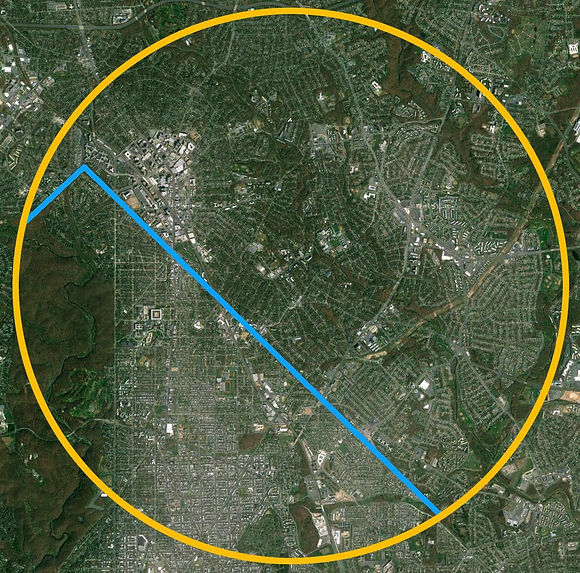 In both municipalities land use is primarily residential, though it encompasses the downtown district of Silver Springs, Maryland. Some of the diversity is evident in the varying patterns of greenery. On the Maryland side the development is generally more suburban, with larger lots and more trees. On the D.C. side the neighborhoods are more urban in character, except for the greenbelt at the left that is Rock Creek Park. The manner in which the principles are evolving into a system of governance for Takoma Radio—both within their small group, and for the larger community they’re creating—becomes ever more apparent as you go down the list. At the most basic level of Principle Two, within their small group, they try to ensure that the two young workers—Tatyana and Désirée—receive ample compensation for the effort involved in launching a new radio station, despite the fact that they don’t have a lot of money at this point. This may be in the form of large measures of appreciative recognition, in addition to cash. At the next level up, they want to provide some pay for musicians and engineers, so that talented people won’t be exploited and financially squeezed. 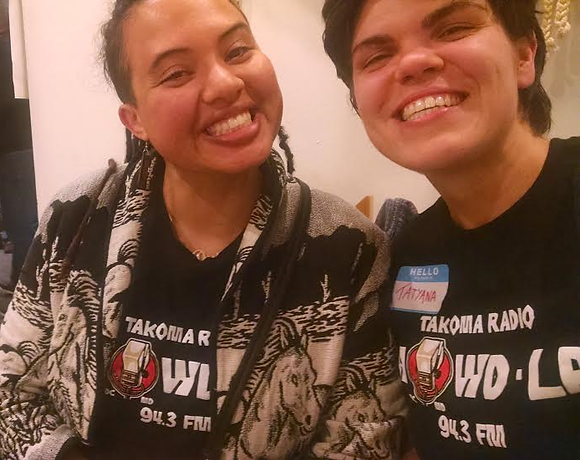 They also have volunteers who take on significant responsibilities, and benefit from making positive social connections as part of the greater (and growing) Takoma Radio group. To meet the challenges of Principle Three, they are building a system of decision-making from the ground up. This begins with forming program committees among their community members who will ultimately decide which programs go on the air; they are constantly reaching out to different segments of their diverse community to ensure inclusivity in this regard. One way of staying in line with Principle Four is to always keep notes at meetings, so they can refer back and measure progress. Each new DJ, whether paid or volunteer, will have a trial period, during which their shows will be monitored by members of the appropriate program committee. They will keep track of how each new member is performing, in terms of showing up on time, and completing the required functions of their role. They credit PROSOCIAL with helping them think about these measures before they opened their doors. For Principle Five, they are instituting a two strikes policy. If there’s an infraction of rules on the part of the DJs, that’s one strike—a friendly reminder. Two strikes means you’re off the air, but not necessarily permanently. They also have a process for getting back into the station’s good graces. Disciplinary measures are handled by the programming committees, which guards against arbitrary exercise of authority. Having all of their rules clearly written down makes them easier to enforce—for instance, a ban on hate speech which is clearly out of character with their central mission. They haven’t had much in the way of conflict yet, so Principle Six hasn’t really come into play. They’ve had some minor disagreements with Historic Takoma, their parent organization, but they were able to resolve them. For future needs, they have engaged both a lawyer experienced with nonprofits, and a volunteer lawyer who works with the FCC. Principle Seven is in the process of being worked out. Technically Historic Takoma — an autonomous nonprofit –– holds the FCC license, and some on their board thought they should have the authority to hire and fire. However, Takoma Radio members feel that such a top-down process is not in keeping with the bottom-up, grassroots nature of their mission. In any case, they’ve made the necessary agreements so that Takoma Radio has the authority to self-govern in the ways that count. Finally, Principle Eight is essential for the larger mission that Takoma Radio is all about. In addition to working out the details of their long-term relationship with Historic Takoma, everything they do is aimed at creating positive relationships with other groups —government groups, NGOs, activists, musicians, and writers. They want to be a forum for all these different points of view, as well as an organizing force for the entire community. 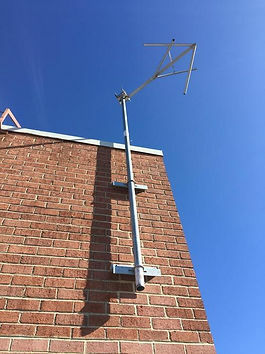 While they won’t begin broadcasting until sometime in June, their studio is being built, their antenna is mounted and ready to go, and most importantly, they are taking extraordinarily effective steps to expand their PROSOCIAL mission in a highly inclusive way. The principles are serving not only as a governance system for their small central group, but as a means of governing the common resource they are creating for the community at large.